Previously, we’ve covered top 40 Agile Scurm interview questions on our blog that has been appreciated a lot. But we’ve received suggestions by many of the readers to cover Agile interview questions and Scrum interview questions separately. So, here we bring top 25 Agile interview questions and answers. If you are preparing for an Agile interview, these latest Agile interview Questions and Answers will prove an important resource for you. Whether you are in a role of developer, business analyst, scrum master or project manager, Agile has opened up quite an excellent opportunity in your next career move with a market share of about 27%. Keeping this in mind we have designed the top Agile Interview Questions and Answers for 2019 that will help you crack Agile interview with ease. 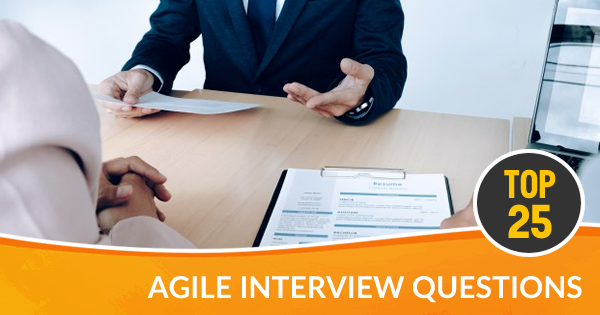 It’s the time to prepare yourself with the best agile interview questions and answers. We have categorized the Agile interview questions in a role-specific manner like agile interview questions for scrum master, agile interview questions for project manager, agile interview questions for business analyst, behavioral interview questions for scrum master and of course generic and most popular agile interview questions and answers. Hope it will help you to choose and prepare with latest Agile Interview Questions as per your specific roles. 1. 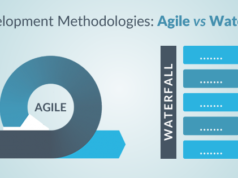 What are the differences between Agile and Waterfall model? In an agile model, all of the phases like requirement analysis, design, development, testing, and release happens simultaneously in each sprint. In waterfall model, work follows a sequential pattern, i.e. the next phase starts only after completion of the previous phase. In a typical SDLC requirement, design, development, testing, and release come one after another. The agile model ensures a faster delivery and completion of a project as customers provide continuous feedback with each sprint that makes any correction fast. Also, it reduces the chance of huge rework at a later phase of the project. In waterfall model usually customers provide their feedback at later phase of the project which sometimes causes the possibility of huge changes and reworks. Any required changes whether it is requirement or development related is applicable in an agile model. Waterfall model does not support continuous changes. For example, if requirements are locked down, and any further need of requirement change or a new requirement comes up in the future then it is considered a change request. Agile model is a self-motivated process where the project team runs the overall process in a self-organizing way. Project managers in a waterfall model control decisions. The agile model ensures less rework. Consequently, it increases the amount of return investment. Due to late feedback from customers sometimes in a waterfall model project faces a good amount of rework and changes. In a waterfall model, each phase consists of different team. Hence sometimes it causes coordination issues. 2. What is the basic difference between Scrum and Agile? Answer: Scrum is a lightweight framework which comes under the umbrella term Agile that consists of principles and values. 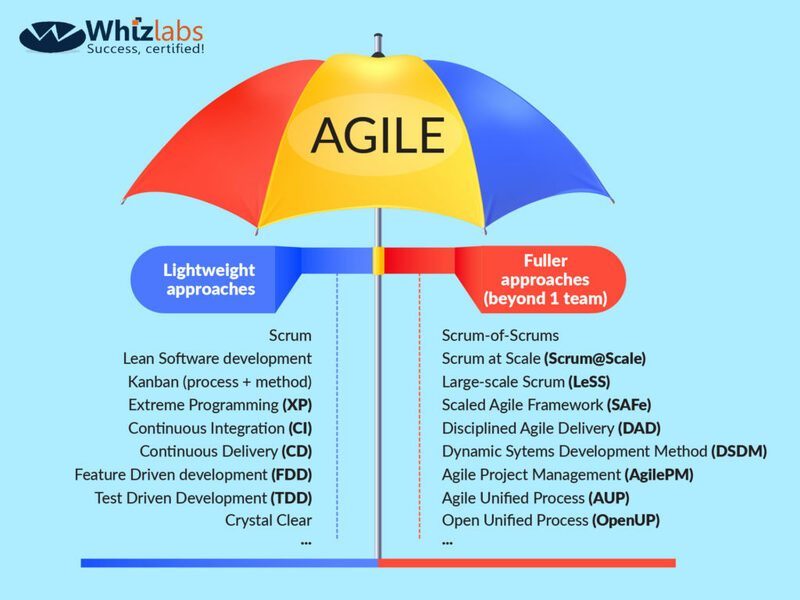 Agile involves a number of processes, methods, and Scrum is also an approach involved in Agile. 3. What is the difference between an Iteration and a Sprint in Agile? Answer: Iteration defines a single development cycle in an agile method. It is a common term used for the iterative and incremental development process. On the other hand, the term Sprint is Scrum specific only and defines one development cycle of Scrum. 4. What are the different roles in a Scrum Agile model and their functionalities? Organizes and holds daily Scrum that is a 15-minute team meeting for the status update. • Works on external obstacles that could interfere with the team activity. • Overall works as a facilitator. In an enterprise-level agile model, additional roles may be a need. These roles could be similar like a delivery manager, program manager, chief architects, etc. 5. What does story point mean in Scrum? Answer: It means the total effort required for implementing a backlog. 6. 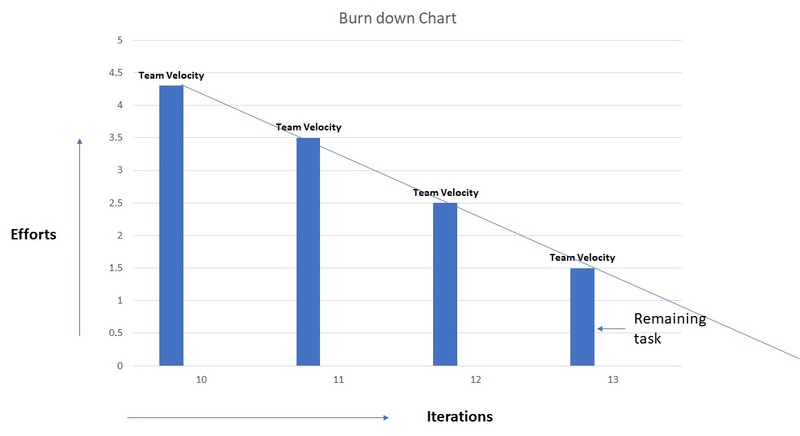 What is a burndown chart in Scrum? Answer: It is a graphical representation of backlog versus time. In the graphical form, the X-axis represents working days and Y-axis remaining effort. 7. What is Scrum of Scrum? What is a particular team supposed to do and accomplish before the next meeting? 8. How do you perform Agile? Answer: Agile is performed using a process called Scrum. In an agile project, we follow the INVEST strategy for every user stories. Once the agreement is finalized regarding which user stories to begin with, the PM initiates the sprint which is a definite work period for the task.It may last a few weeks to a month. During the sprint execution the team meets in daily scrum call and if necessary in a scrum of scrum to discuss requirements and development progress. These calls also handle any obstacles that the respective teams are facing. Once a sprint is over the features are verified by the Product Owner for acceptance. The overall process gives the team a scope to learn what has been done best and how to improve the next iteration further. The product backlog is maintained and prioritized by the team for future features and requirements. As the project gets the scope to see the result at the end of each iteration hence business waits less time to see business value. 9. Explain the term INVEST. Answer: The term INVEST is an acronym which Business analysts and product owner follows to write user stories. I – Independent – This signifies that a user story should not have any inherent dependency on another user story. V – Valuable – A user story must provide business value to the end user. E – Estimable – The user story must estimate the size of a user story. S – Small – User stories should maintain the size that makes it impossible for planning, task, and prioritization feasible with a certain level of certainty. T- Testable – The user story with its description must implicate the necessary information to make development and testing possible. 10. What are the pros and cons of Agile method? The agile method ensures faster delivery as there will be a less waiting period for a working solution. The documentation requirements are much less than the waterfall model. Agile allows responding quickly in rapidly changing situations. Budgeting and accountability is a complex process in agile projects as man-hours are not used in project estimation. It is possible that requirements may pop up during an iteration that may push a future agile sprint. Agile put stress on “wait and see” approach which may increase the chances of additional iterations with increased time and cost. 11. What are the 12 Agile principles? Focus on how to become more effective on a regular basis. 12. 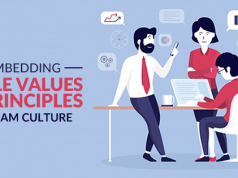 What are the values that Agile manifesto follows? Individuals and Interactions Over Processes and Tools – that implies people and interactions among them more valuable than process and tools used for a project purpose. Working Software Over Comprehensive Documentation – To reduce the enormous effort for project documentation agile believes in meetings and interactions among teams. Customer Collaboration Over Contract Negotiation – With continuous delivery and feedback process Agile manifesto engage and collaborate customers throughout the project to meet the project needs. Responding to Change Over Following a Plan – Agile views changes as improvement of the project. 13. What are the different frameworks used to coordinate between more than one Scrum teams? However, which one you should apply that will depend on the team size. 14. What are the indications that Agile is working in a team? Increased interest and participation of stakeholders in agile meetings like in the sprint demo. 15. Explain different artifacts in Scrum. Velocity chart (VC) • A velocity chart represents the sum of estimates of the delivered work across all iterations. Release Backlog (RB) • Same as the Product Backlog. May involve one or more sprints dependent on determined Release date. 16. What is DoD in agile and when you consider it is achieved? 17. The four agile manifesto principles ignore process and tools, documentation, contract, and planning. As a Scrum master, how do you justify it? 18. How would you perform Scrum a sprint planning so that you can assure that your team is working only on most important user stories? Involve Scrum team members in the product discovery process from the early phase. To ensure both the product owner and the scrum team is clear about the backlog refinement process. The user stories must be created as a collaborative effort of the scrum team and the product owner. 19. How would you manage a team member who does not like to follow the daily stand up scrum call and consider it as a waste of time? One to one discussion with the particular team member to make him/her understand the importance of scrum call. If needed the team member could be assigned further training on the agile method. To raise it as an issue through other team members and provide him necessary support to make him understand the importance of stand up call. If necessary conduct meeting with the team member and respective manager for the issue. If no change occurs after following the steps mentioned above then reassigning the person to some non-agile team. 20. What are the important attributes of an Agile project that you use during estimation? Backlog: List of activities “to do” for a delivery team which includes design, development, build and testing. Cost: Iteration based cost of a team. Velocity: In an agile world velocity defines distance over time. Here distance means the size of the backlog and time means iteration length. 21. What is the difference between story points vs. hours from estimation point of view? Answer: A story point is an abstract measure of effort that is required to implement a user story. Story points along with the sprint velocities provide an estimated approach over the next upcoming sprints. It is a high-level estimation and does not provide actual man hours that are needed to complete the task. On the contrary, hours based estimation represents actual effort in man hours. It is a low-level estimation. 22. What are some of the advantages of using story points in Agile project estimation? Story points make it compulsory to use velocity as a team’s performance data for release planning. Using points and velocity story points make planning real. It is performance based. Less stress inside a team as there is no fixed commitment of days. Hence better and rational performance of the team. More collaboration in team’s behaviour. Involves different teams during estimation. Hence, story points encourage the cross-functional behaviour. 23. Name some of the popular Agile estimation tools and techniques. 24. What are the project management tools we use in an Agile project? Also Read: Why Agile Career is a Good Option? 25. Explain “Iteration zero” considering its difference from planning activities in a waterfall model. Setting up development and testing environments. If you want to increase your profile visibility among the top employers then no doubt certification helps a lot. Though with appropriate guidance on agile interview questions you can crack the interview, however, becoming a certified agile professional widens your opportunity. An Agile Scrum master is a certification that not only provides more knowledge towards the project management but also enhances one’s credibility across the roles in an agile project. 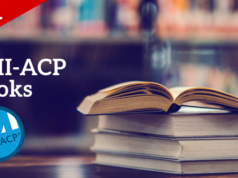 And in this respect, nothing goes better than PMI-ACP. This industry-recognized certification provides an in-depth fundamentals of Agile principles. Also, its accreditation works wonder in the professional growth of the candidate. Hence, if you aspire to become a successful agile professional why not as a certified agile practitioner? At Whizlabs we have leveraged complete guidance through our PMI-ACP online course and practice test. These practice test series also helps to face many critical agile interview questions as these are designed in more elaborate and in-depth way. Join us and achieve the best benefits towards the success goal of your career!